Freetown: His Excellency Dr Ernest Bai Koroma has warned that the term of office for ministers serving in cabinet could be less than the five year term of the "Agenda for Prosperity". He made this declaration at a brief but lively swearing-in-ceremony of twelve newly approved ministers by the noble House of Parliament. The event took place on Wednesday 16th January 2013, at the Credentials Hall, State House. Earlier in the President's office, the reappointed Secretary to the President, Mr. Emmanuel Beresford Osho Coker while subscribing to the oath of appointment, pledged to work with the President in accordance with the Constitution as by law established. "I pledge my loyalty and support to you and I will do my very best in your second term of office", Mr. Coker vowed. President Koroma congratulated Mr. Osho Coker on his re-appointment to the position of Secretary to the President. The Head of State however encouraged Mr. Coker to rise to the expectations of government as there is a very limited timeframe for the "Agenda for Prosperity". 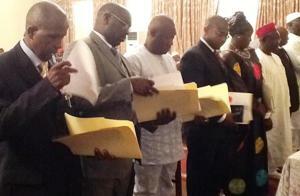 Shortly after the swearing-in-ceremony of the Secretary to the President, President Koroma also administered the oath of office on the twelve newly approved ministers. While welcoming new as well as old ministers into the fold of government, he reminded them that they were expected to sign performance contracts in the weeks ahead. "I hope the confidence reposed in you would not be misplaced, and that you will live up to the expectations of the people of this country. 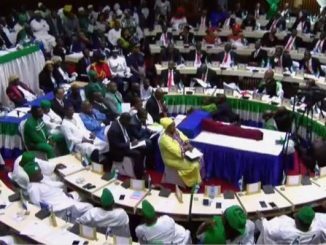 We have to ensure that we lay the basis for the full implementation of the "Agenda for Prosperity", President Koroma said beaming. The Chief Executive also warned the newly appointed ministers that the five year period is a stipulated term for the "Agenda for Prosperity" and not for ministers, adding that the term of office for ministers could be few months or years or even less. 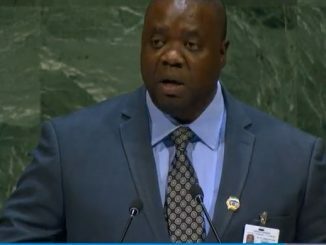 He therefore admonished that being a minister was not about building personal empires or personal aggrandizement, but a unique opportunity to serve Sierra Leone. President Koroma further informed both new and old ministers that when all parliamentary approvals shall have come to an end, there will be a retreat somewhere in the country, where; "we will retreat to digest the "Agenda for Prosperity" to put all of us on the same page". The new and old ministers who took the oath of office were Minister of Fisheries and Marine Resources, Retired Captain Alieu Mohamed Pat-Sowe, the Minister of Local Government and Rural Development, Madam Finda Diana Konomanyi, Minister of Lands, Country Planning and the Environment, Mr. Musa Tarawally, the Minister of State North, Mr. Alie D. Kamara and the Minister of State South, Mr. Muctarr Conteh. 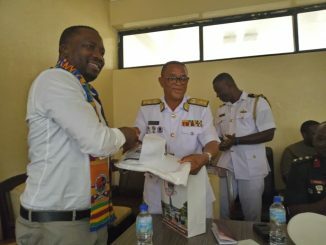 Also among the list of ministers that subscribed to the oath of office were, Mr. Emmanuel Moijueh Kikai, Minister of Social Welfare, Gender and Children's Affairs, Mr. Foday B.L. Mansaray, Minister of State in the Ministry of Finance and Economic Development, Madam Marie Jalloh, Deputy Minister of Agriculture, Forestry and Food Security, Mr. Charles Rogers, Deputy Minister of Fisheries and Marine Resources, Mr. Mustapha Bai Attila, Deputy minister of Social Welfare, Gender and Children's Affairs, Mr. Theophilus Nicol, Deputy Minister of Information and Communications and Mr. Momodu Emmanuel Maligie, Minister of Water Resources. The swearing-in ceremony was graced by the Vice President, Alhaji Chief Sam Sumana, senior government officials, well-wishers, friends and family members of the ministers. 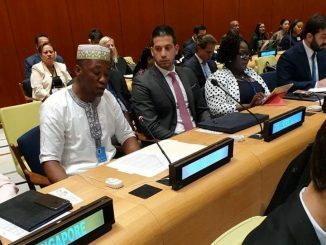 By way of closing remarks, newly appointed Minister of Local Government and Rural Development, Madam Diana Konomanyi pledged on behalf of colleague ministers to work tirelessly to support President Koroma's vision for Sierra Leone as encapsulated in the "Agenda for Prosperity". She profusely thanked the president for picking them out among six million people for national service.